Everything you need to run your business and maximise the success of your store. 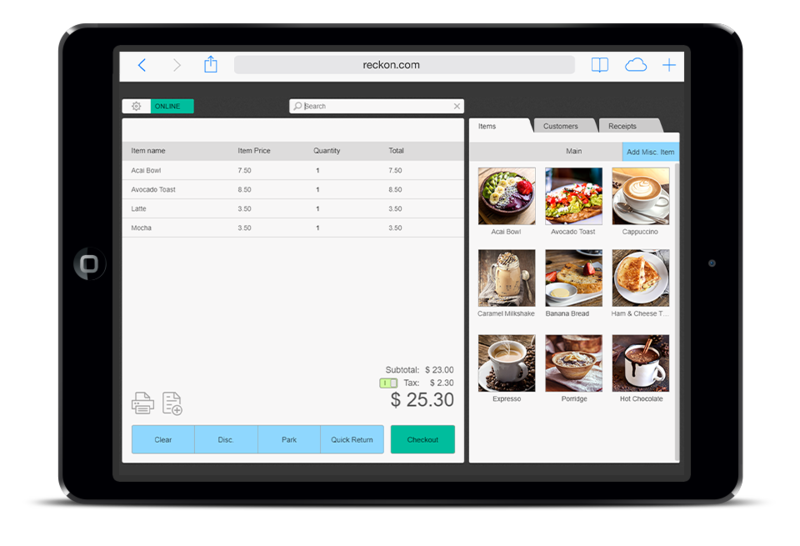 Reckon Cloud POS has an easy-to-use interface with all the features you need to run and grow your small business making it ideal for cafes, small retail stores, sporting clubs and market stalls. Accept a variety of payment methods including cash, debit cards and credit cards. Operate your store on the go, with the flexibility to work online or offline. View customer information, add notes or access a full transaction history so you know what they bought and when, for improved customer service. Quickly add products and categories via csv upload. Understand what your best sellers are and sync to accounting software. Organise your team and manage the access permissions of each employee. Easily track employee sales by assigning them to each sale. Attract and retain customers through segmented promotions including digital punch cards, loyalty programs, birthday rewards and VIP discounts. Check live reports for your daily sales figures. You can filter by product, customer, category, dates and much more to analyse your store data.